A few weeks ago we had visitors for a half-day, friends connecting through Krungthep on their way to Phuket. They are one of those global couples – an Austrian working for a German company living in Singapore whose partner is a Korean doing research in Switzerland. With only a few hours to show them a slice of the Big Mango, I took them to Ratanakosin Island – the “Old City” – for a self-guided audio tour. 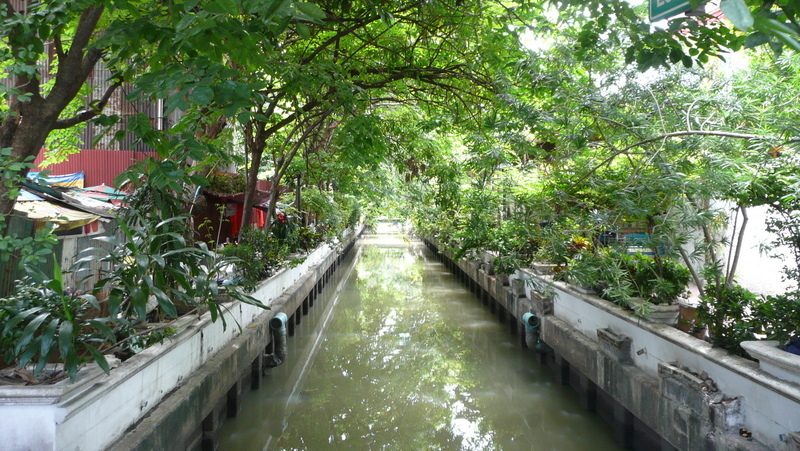 Above, a view of Ratjanatda Canal at Tanao Road near the Democracy Monument. This neighborhood, filled with families who have lived here for many generations, is in the sights of the Bangkok Metropolitan Authority’s redevelopers. They would like to “rehabilitate” this area to make it an arts and entertainment district. Locals, as you might imagine, aren’t so keen on the government’s ideas and would prefer to undertake their own rehabilitation. A small side soi – Phraeng Phuton – is described as the best-preserved heritage neighborhood in the city. Residents restored the community and improved the landscape. 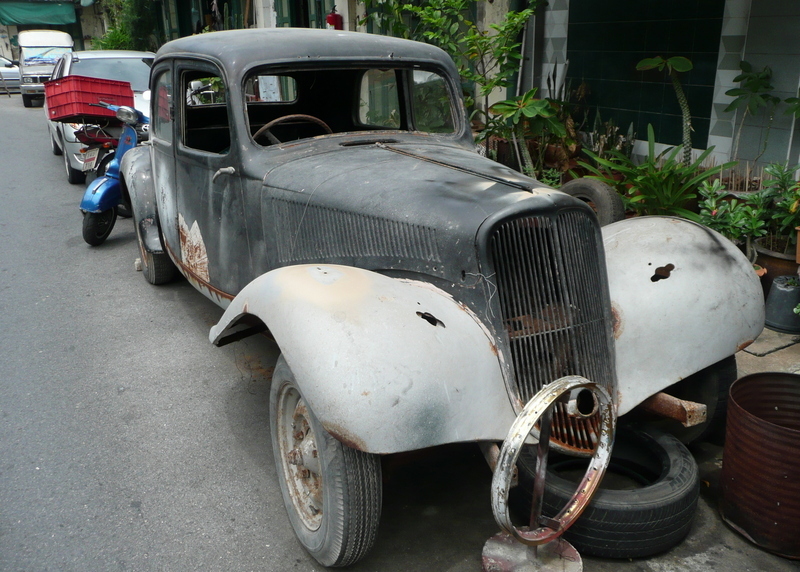 An open square in the center of the block is still used for public performances and plays, just as it used to be during the reign of King Rama V.
A local businessman has many antique cars, some of which are actually in superb condition, at what was one of the first automobile repair shops in Siam. It was also the first driver’s license bureau in the city. Above, one of the owner’s more recent acquisitions, a piece that is going to need a lot of work to restor. Across the street was another interesting car, below. I don’t think I’ve ever seen a Mini Moke. Walking through the monk accessories district (alms bowls, anyone?) 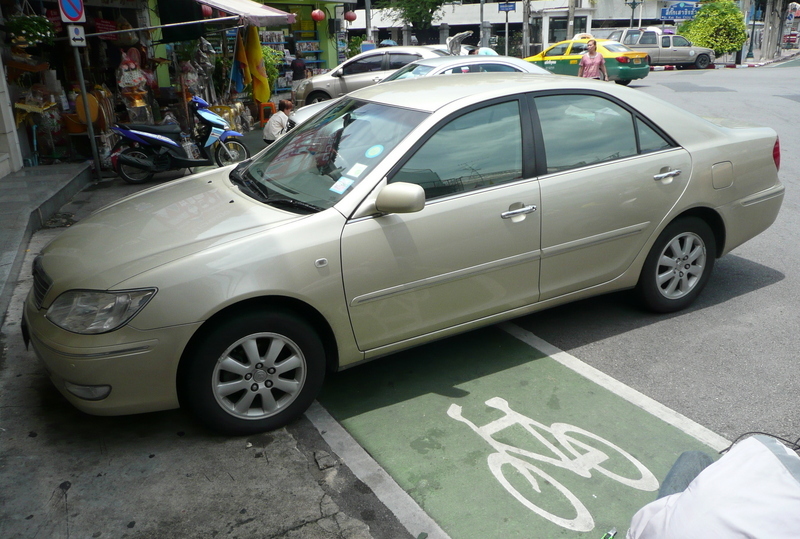 at the intersection of Tanao Road and Bamrung Muang Road, I was reminded why bicycle riding in the old city is such a challenge. There are actually these cool green bicycles available for hire and a corresponding green path taking you to various places of interest in the old city. Fantastic idea. Poor execution. 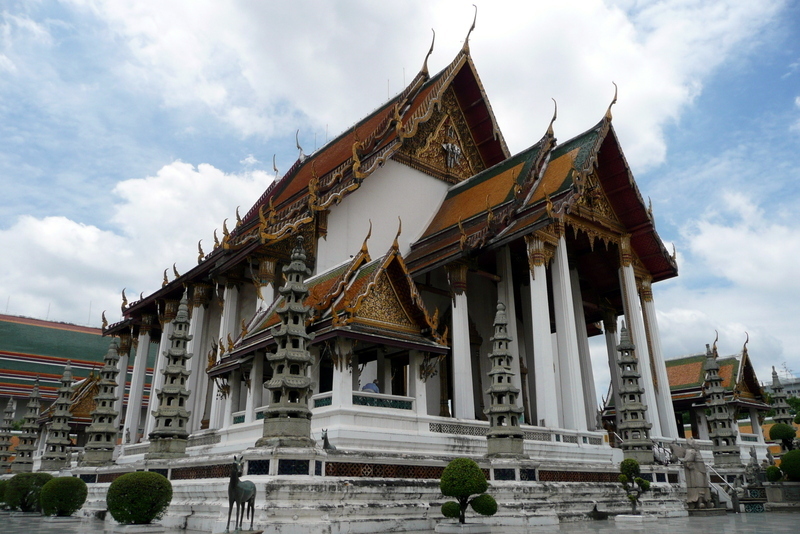 We stopped by Wat Suthat, the tallest temple in the city and ostensible center of the universe. Wat Suthat is considered the most finely-proportioned temple and is one of the highest-ranked royal temples. The temple grounds spread more than 45,000 square meters and has the largest bronze Buddha image in the kingdom. Construction lasted from 1807-1847 with King Rama I laying the cornerstone of the main sanctuary’s foundation. 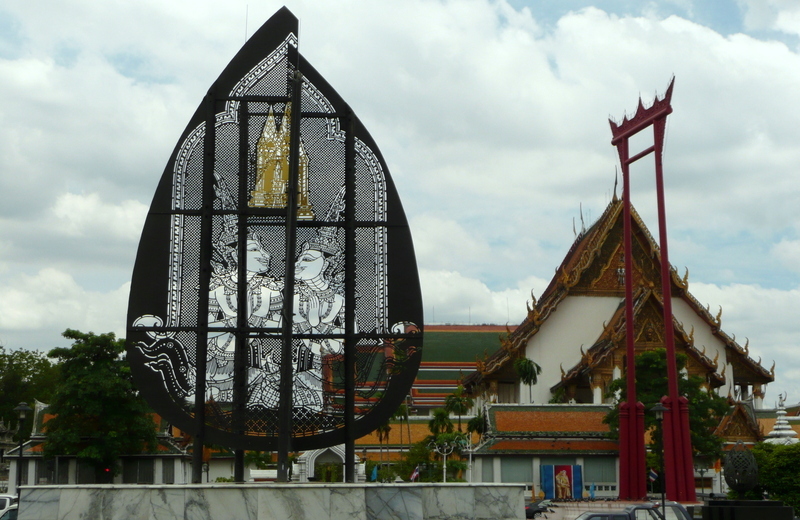 Across the street from Wat Suthat is Kor Tor Mor Square, a large public square that also faces the Bangkok Metropolitan Authority’s headquarters, City Hall. You see the red Giant Swing, which was rebuilt last year by an aging craftsman in northern Thailand. The Giant Swing is part of a Brahmanist tradition and was used in ceremonies honoring the god Shiva. There used to be an actual swing and young men would compete in a contest to bite a bag of coins from a bamboo pole while riding on the swing. This contest was discontinued as deaths and injuries were too common. In ancient Siam there were giant swings in all the major towns. The original one here in Krungthep was nearly twice as tall. And that’s your snapshot tour of Ratanakosin Island! This entry was posted in Uncategorized and tagged Bangkok, Krungthep, Ratanokosin Island by christao408. Bookmark the permalink. Thank-you for the tour – fascinating. Enjoy your movie marathon festival. Wish I had a job that would allow me to see movies all day and night… I’ll keep dreaming. Oh, this looks like a nice spot for sight seeing. 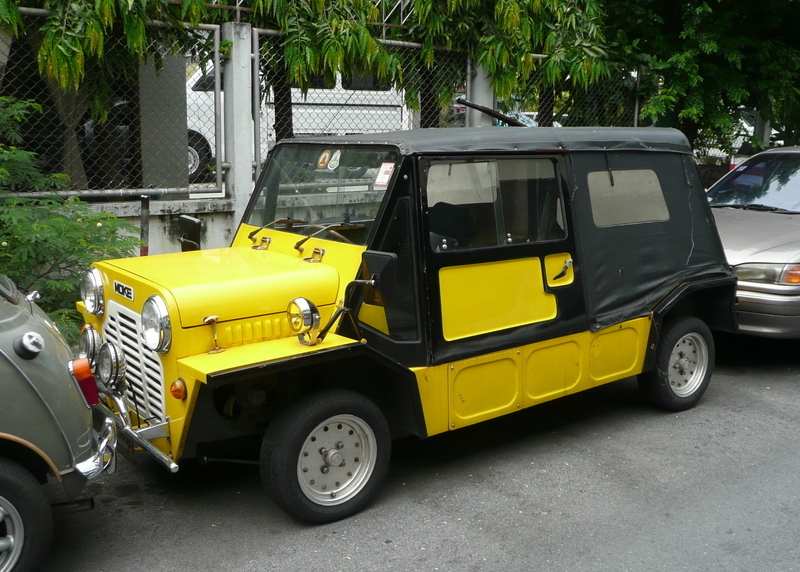 The mini moke – how the heck did the driver park like that? The inner architect in me is geeking out over that temple. It’s absolutely stunning. That roof is absolutely amazing! Have you ever been inside? If so, what does it look like? I’m assuming you can’t take pictures inside. Wow that looks cool!Definitely poor execution lol…Never seen that car either. @murisopsis – Thanks, I’m glad I have a job that allows me some flexibility. @ElusiveWords – That’s a wonderful question. Must have quite good turning radius or else he did a thirty-point turn to fit into the space. @TheCheshireGrins – Pictures might be allowed, I’m not sure. But here is a link to some: http://www.bangkoksite.com/watsuthat/index.htm. Click on the “Wat Suthat Amazing Pictures” link at the top of the page and you’ll lead to a few more pages of… well, amazing pictures. @yang1815 – The gov’t here gets all these great ideas – “Let’s have rental bikes just like in Amsterdam!” – but doesn’t change any of the conditions necessary for the ideas to thrive. Just like deciding you want to grow green beans so you through some seeds on the dirt and expect them to grow. You do have to prepare the ground, water, tend to weeds, etc. @CurryPuffy – If it weren’t illegal for non-Thais to be licensed tour guides, I would probably do that. The picture of that Temple is incredible Chris. I love the architecture, which looks delicate and strong at the same time. Just beautiful. I can’t wait to come visit you so you can show some of these places to me. Have fun at the movie bonanza. @christao408 – Ooo, I loved the pictures! I love how many intricate details the temples have. They are really stunning!